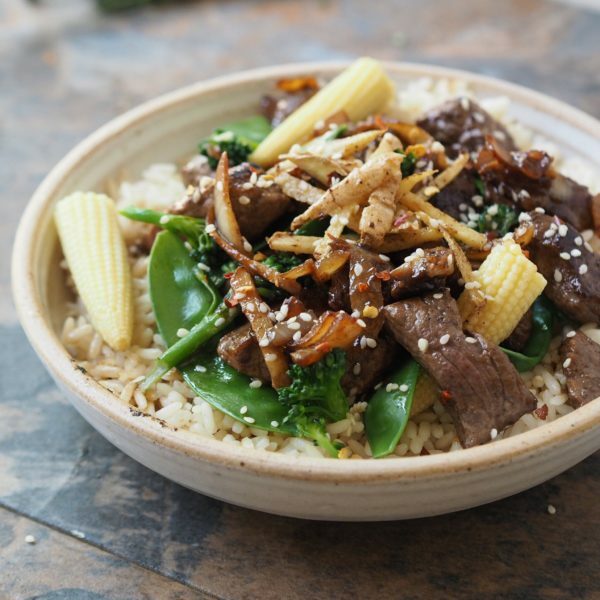 Try our Oriental Beef Stir Fry recipe for dinner tonight! Slice the beef into thin slices across the grain. Heat the oil until shimmering hot in a wok or large high-sided frying pan. Add the ginger that’s been cut into matchsticks and fry for 2-3 minutes until golden and crispy. Scoop out of the pan with a slotted spoon and leave to drain on kitchen paper. Bring the temperature back to very hot again. Sprinkle the salt and pepper on the beef and add half the beef to the wok. Fry, moving around a few times until browned (about 3-5 minutes). Spoon out with a slotted spoon and place in a bowl to rest. Add in another 1 tbsp. of the oil if needed and cook the remaining beef in the same way, then place in the bowl too. Add a little more oil if needed so you have around 2 tbsp. of oil in the wok. Heat to a medium heat and add in the chopped onion. Fry for 2-3 minutes until just starting to soften. Add in the minced ginger and garlic and fry for a further 30 seconds, then add in the broccoli, spring onions, baby corn and mangetout. Stir fry for one minute, then mix together the sauce ingredients and add to the wok. Allow to bubble and thicken for one minute, then add the beef back in. Allow to heat through for a minute or two and turn off the heat. Top with the crispy ginger matchsticks and a sprinkling of chilli flakes.